Since the arrival of the Mac Intels, people have been asking whether it can run Windows. The answer's been a resounding 'Yes'. Apple's own Boot Camp enables you to install Windows XP natively on your Mac, enabling you to boot up into either OS X or XP. VMware's Fusion and Parallels Desktop both enable you to run Windows and other operating systems, virtualised on your Mac. In all these cases, however, there's been one big drawback: you need Windows. You have to go through the rigmarole of installing Windows, updating it, installing anti-virus and anti- spyware software, configuring it and so on. When people say they want to be able to run Windows on their Macs, what they usually mean is they want to run Windows software. This is where CrossOver Mac comes in. It's based on the long- running open source project WINE, which attempts to replicate from scratch all the functions of Windows necessary to run programs. 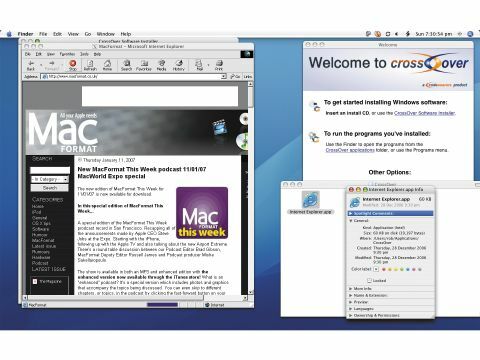 The idea of CrossOver Mac is to install Windows apps on your Mac and run them as though they were normal Mac applications. All you need is the X11 windowing system that came on your OS X installer CD or system disk. In practice, you launch CrossOver and either insert a Windows installer CD or run the CrossOver Software Installer. If your Windows app is supported, everything should be fine. Unfortunately, there are only roughly 13 programs supported. These include Internet Explorer 6, and a few things that aren't actual programs, such as DCOM98. Most major DTP and web design apps, such as InDesign, Illustrator and QuarkXPress are unsupported, and those that are don't get support for the latest version. If your desired application is supported, all is well and good. CrossOver will walk you through the installation process, step-by- step, creating the right kind of environment for the job. When it's done, you get a double- clickable Mac application. We tested Office 2000 and IE6 and both work fine, although they didn't look exactly like a standard Mac app, having the feel of a 'Macced-up' Unix X11 program that's a pale version of their Windows incarnations. They worked full-speed, though - faster, in fact, than most native OS X applications, since they weren't encumbered by Aqua - and did what you expected of them. Even little niceties, such as the Mighty Mouse scrollball, worked fine. There's no equivalent to Windows' beloved Ctrl Alt Del combo built into CrossOver, however, so quitting an unruly app often requires quitting CrossOver altogether. If your application isn't on the supported list, you're in thorny territory; you have to create your own environment, decide whether to pretend to be running 98, 2000 or XP, locate the installer file and more. It's not an easy job. We were able to get Photoshop CS to install but didn't get further than the splash screen: an upgrade version of Illustrator 9 would crash when trying to locate the older version; Dreamweaver MX and XPress 4 got precisely nowhere; the same goes for Doom, Quake and the less taxing Theme Park Hospital, although the latter did manage to install both itself and DirectX, even if nothing happened when we launched it; and Fireworks MX installed but crashed with a fatal exception. Newer software didn't fare well, either, particularly since .Net apps don't work so well in CrossOver. However, Project 98 worked fine, as did Acrobat 5. There's an online database of 2,500 or so apps that you can search through, to discover whether CrossOver will work with your program of choice and what settings you should use. Looking through the list, though, you'll find precious few games or DTP packages, for example. In fact, the majority of the apps we looked at were listed as 'not tested'. At the moment, we can't recommend CrossOver for general use. If you have one of the 13 'gold medal' applications, then it's great. At roughly £40, it's probably more expensive than it should be but compared with the cost of a Windows licence plus virtualisation software, it's a bargain. But if your application isn't on the supported list, don't try it yet.